Chrissy LaMaster's home. Taken in May, 2018. Nestled on a quiet street just down the road from the Historic District of Bloomington, Illinois stands the charming studio apartment of Chrissy LaMaster. On a sunny, spring morning I couldn’t help but notice the lush grass and the warmth emanating from the exterior. Even a brief glance at the rustic red door gave a sense of the character of the place and a desire to discover what the interior held in store. 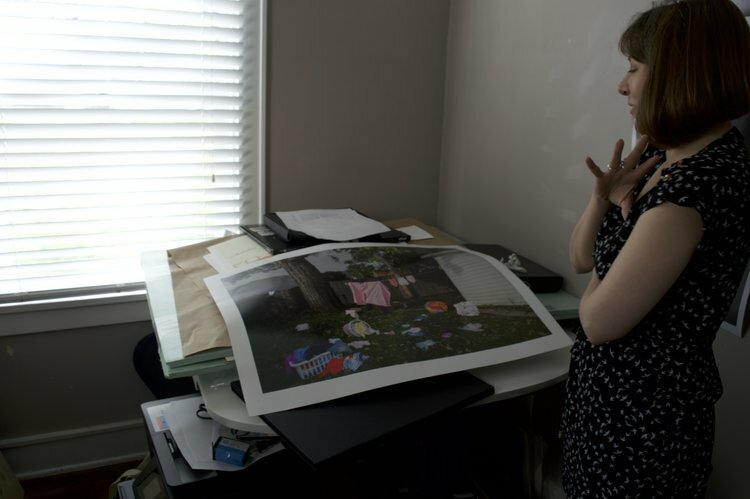 The space Chrissy lives in also happens to be the setting of her newest body of photographic work which explores themes of identity, motherhood, and domesticity with a growing emphasis on transition, the body, and becoming. Stepping in, I was immediately greeted by warm, beige walls, antique looking furniture and decor, and sunlight seeping in through open windows and blinds. Simple and homey with little pockets of color here and there, I felt comfortable and saw a place appreciated by someone who cares about integrity and the simple joys of life. As Chrissy walked me through her apartment, I began to see delicate cracks in the walls and how the sunlight bounced off each surface changing colors in subtle ways. I didn’t realize how much one shade of beige could change. I asked her what the best time of day was for her preferred lighting and she said, “in the afternoon around 3 or 4 o’clock.” Since most of her current photographs were shot in the winter, I imagined how the light would change as the seasons shifted and wondered whether this time would change too. She told me that she would be very interested to see since light plays one of the biggest roles in how she thinks about her compositions and the way they configure formally. Chrissy's newest series hanging on the wall. Taken in May, 2018. As we settled into the second bedroom which serves as Chrissy’s office/junk room/critique space, I saw stacked boxes and bins full of different supplies and photography equipment scattered about the room. Upon coming across some cut out letters among colored paper, markers, and sewing supplies, I learned from Chrissy that she teaches general art to pre-schoolers and has continued to do so for the past 20 years. As a mother herself, she mentioned that she enjoys working with children and that her own inspired her to begin taking photographs of what motherhood means to her and other mothers. Seeing her current series tacked on the open wall adjacent to a few earlier pieces of hers, I saw the personal touches within each and how they all reflected identity in unique ways. I was struck by the way in which they configured pattern in some form or another, whether it be from light, digital or physical manipulation, or color. On the surface, her current photographs appear stripped down leaving the viewer with a vague sense of who the character in the image is and how they inhabit the actual space. I felt a deep connection to nostalgia and memory regardless of the experiences being separate from my own; certainly gaining a sense of how strongly identity resonates with viewers and how impactful Chrissy’s work is in both its content and clarity. Stacks of Chrissy's books on the coffee table, Taken in May, 2018. Transitioning to the living room, the main space Chrissy uses to compose her images, I found it easy to see why she is drawn to photographing her home. Naturally, the room is filled with sunlight and open air. There is a remarkable ease when walking through the space and sitting within its walls. I thought to myself that this is a place anyone would be lucky to live in and one that Chrissy has livened with her own sensibility. On a worn, wooden coffee table sitting just in front of a cream-colored sofa lays a spread of books on Carrie Mae Weems, Laura Letinsky, and Dutch painting. Certainly inspirations for Chrissy herself, I could clearly see how the work of these artists influence her eye as a photographer and the elements she finds significant within her own work. Chrissy discussing one of her photos. Taken in May, 2018. After seeing her new series, with a better sense of what her apartment feels and looks like, I understand her work as a celebration of light and the formal qualities of an image that make it compelling to look at. Her work does not call out for attention through what it represents but rather in the manner of its presentation and captured qualities. Each piece showcases the subtle beauty found in a specific moment of time and place. They highlight aspects of a character who is assured and meditative and further reflect the balance of that figure as they fill the space they are in. As a whole, the series emphasizes the transition from light to shadow and the unconscious imagining of how one moves through space and performs acts of daily life. And similar to Laura Letinsky, the skill with which Chrissy captures each tableau causes her viewers to appreciate her photography for its simple elegance and stunning display of the essence of what photography is. I asked Chrissy what the next step is for her and her work as she continues thinking about her apartment and the way it relates to her growth as an adult. She said, “Well, over the summer I will be in Montana living in a new home. I’m not sure if the images I make there will be an extension of this series, but I will be thinking about similar ideas. I have been out there already, and the home is much newer. It’s only about 5 years old. Plus, the walls are a completely different color. They’re much more golden. The light is very different as well, and I might have to push my work to explore the landscape in addition to the interior space.” While her summer departure may take her work in a new direction over the next year, as Chrissy returns to her spot in Bloomington, Illinois she will continue to create images exploring her apartment and how she continues to think about it, live in it, and change both within it and within herself. The series will culminate in her capstone thesis as she receives her MFA from Illinois State University in 2019. Jessica Tackes is an undergraduate student in Art History at Illinois State University in Normal, Illinois. She is the current curatorial intern at the University Galleries of Illinois State University.